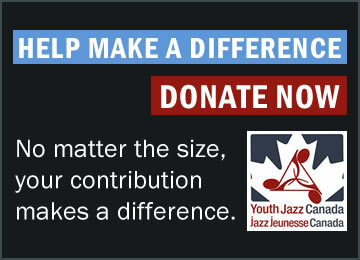 Youth Jazz Canada Thanks You! 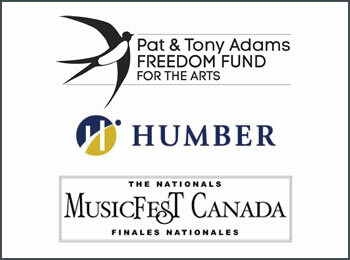 Your support is greatly appreciated and will benefit many of Canada’s finest up and coming young musicians. Please look over the instructions and when you are prepared to proceed, click on the CanadaHelps logo below and you will be taken to Humber’s donation page. From there, click on the Donate Now button and you will be taken to the page displayed below where you will be able to make a charitable donation in just a few quick steps. 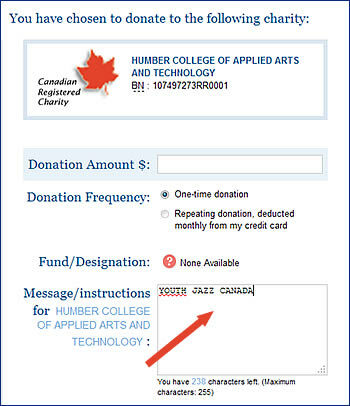 Under Donation Details, you will see Humber College of Applied arts and Technology followed by Donation Amount and Donation Frequency. After completing these two sections, you must jump down to the Message/Instructions box. If you would like to further direct your contribution to support a particular area of the project, please indicate this in the same box. The next step will ask you to enter your email address which will be used to issue you a charitable tax receipt for your donation. Once again, thank you for supporting the next generation of Canadian jazz musicians!